Hi friends! In Karber Shop We have a Special for our customers, celebrating Labor's Day! 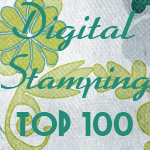 From Saturday 3rd to Monday 5th of September, If you spend $5.00 USD or more you will receive a free digital stamp of your choice.